Summary: Dracaena Janet Craig is an interior workhorse, popular for decades, used frequently as a floor plant in interior situations or mass planted in beds. Survive low light levels, grows best in filtered light. Janet Craig has been an interior workhouse and one of the most popular plants used indoors for decades. Although this Dracaena can reach heights of 15 feet in its native Africa, plants grown for indoor use are much smaller in size. Usually propagated as tip cuttings, 3 to 4 stalks or tips per pot. Janet Craig plant has shiny, solid, wide, dark green leaves, with wavy margins, measuring 3 inches wide and approximately 2 feet long. Their long, tapered leaves, pleated like foliage, and rich green colors help make them attractive plants for interiors. Used frequently as floor plants in interior situations or for mass planting in beds. Most plants grown for interior use are 10 inch pots with 3 plants per pot, ranging in height of 24-32 inches. Some 14 inch pots are grown as well with 4 plants per pot and reach a height of 30-42 inches. When purchasing a bush form of “Janet Craig” Dracaena look for a plant whose width is 50-75% the plants height. Over the last few years we have seen the introduction of Janet Craig cane-type plants enter the market from some Hawaiian growers. We see some taller plant sizes produced reaching heights of 6 – 8 feet in very small pots compared to their height. It should be noted, the correct botanical name for “Dracaena Janet Craig” is Dracaena deremensis “Janet Craig” and known throughout the plant industry simply as “Janet Craig”. The history or “beginnings” of Janet Craig goes back to the 1930’s or so. 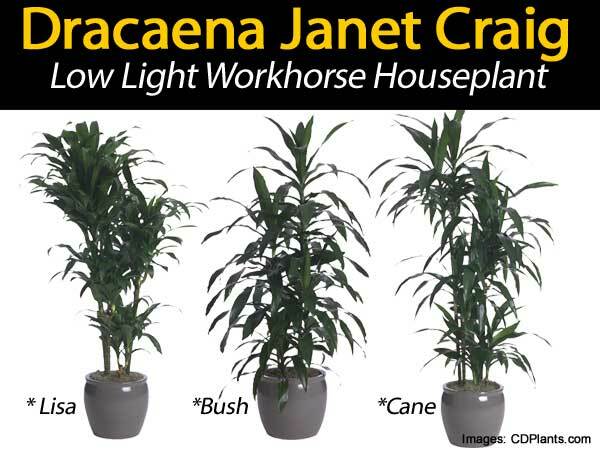 “Janet Craig” is actually a ‘sport’ or a variant of Dracaena Warneckii and was named after the daughter of nurseryman Robert Craig, who lived in the Philadelphia area. 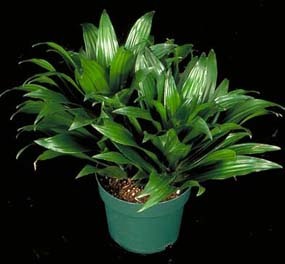 As understory plants, Janet Craig Dracaena is an excellent low-light interior plant. Add her ability handling low humidity, air conditioning, plus infrequent care – you have the making of a very durable indoor plant. It survives low light levels, but grows best however in filtered sunlight. Dracaena deremensis cultivars do not like heat. This is very important to remember especially during summer months when plants have a tendency to discolor. Recommended maximum temperature is 90 degrees. As temperatures increase above 95 degrees, problems with leaf discoloring and leaf notching may develop. In the nursery Janet Craig grown in deep shade, not because the plants want low light. Growers shade Janet Craig more for temperature control than reducing actual light levels. Below 70 degrees, Janet Craig shows little growth. Cold damage will occur around 35 degrees or if plants are exposed to 55 degrees or lower for a week. Janet Craig needs a well drained potting medium. A mixture of peat and pine bark with perhaps 10% sand – stay away from perlite on Dracaenas because of fluoride problems. Fluoride is great for teeth but not for Dracaenas. It is best to avoid wet or dry extremes. You will do much better keeping Janet Craig on the dry side. Janet Craig is an excellent candidate for sub-irrigation. Allow the soil to dry between 1/3 to 1/2 down before watering. Do not let your plant sit in water. Water thoroughly and remove the excess water from the saucer or bottom of the decorative container. If not excessively fertilized, the plant will tolerate considerable dryness. While talking about watering, let’s look at the roots. Janet Craig and Dracaena Warneckii have almost two root systems. The main root and the finer secondary roots. If you want to maintain a good strong plant make sure the fine secondary roots are healthy. If the secondary roots experience problems, the plant quality will go down hill quickly. The leaves over time will collect dust, using a feather duster regularly will help keep foliage clean. Trim brown tips and edge of leaves to a natural contour with scissors. Most Dracaenas grown commercially are fluoride sensitive, Janet Craig is are no exception. The use of fertilizers indoors generally increase the possibility of damage from salts. Fertilizers leave salts behind in the soil. Roots pick up the salts moving them to the leaves. These “salts” accumulate in the leaf tips, and over time the salt levels become too high, burning the leaf tissues and leaf tips turn brown. Growers use special fertilizers to grow Dracaenas. I would recommend you DO NOT fertilize your Dracaenas unless you use the correct fertilizer and understand the plant completely. Janet Craig has relatively few insect pests. Scales, and mealybugs are occasional problems. 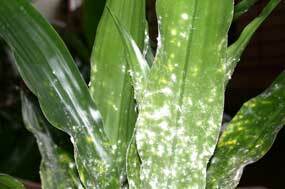 Mealybugs are identified by their white, cottony masses, which may move slowly. If you’re having trouble with insects or pests on Dracaenas and other house plants spend some time to learn some check out there pest control basics. There are several “new” varieties of Janet Craig which have been introduced over the past few years. Primarily these have come from the Hawaiian growers who discovered these new “sports” in the production process. Also an excellent low-light plant, Dracaena Lisa at first look, appears like Janet Craig. After a closer look, you will see, the leaves of Dracaena Lisa are much narrower. 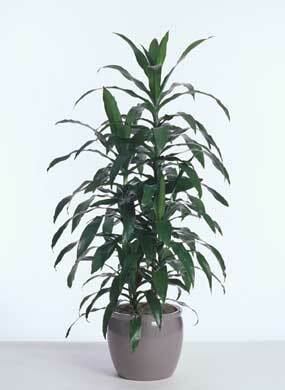 The lush dark green foliage of Dracaena Lisa are attached to its notable green trunk, which also distinguishes it from Janet Craig. Lisa is an upright columnar plant usually reaches a height of not more than 8ft high. It has been grown exclusively in Hawaii and supply can be very limited. The green trunks of Dracaena Lisa and the upright growth of the plant made them perfect cane plants. “Exotic” Dracaena Lisa canes make a nice focal point in easily seen areas at home. A combination of Dracaena Lisa in staggered canes or various heights make them very attractive even in narrow spots in offices or buildings. Dracaena michiko is one of the world’s most sought-after dracaena hybrids. This fabulous plant is imported from Hawaii and commonly known as Michiko cane because of its cane-like structure caused by its upright growth habit. The leaves of this plant are held tighter to its trunks. This makes the plant a perfect plant to be put in narrow or tight areas or rooms with limited available space. Dracaena Michiko plants grown in Hawaii seem to have greater life expectancy because of their extensive, well-developed root system. The large size, full-grown look in smaller pot sizes mean lower expenses spent on pots or decorative containers. Michiko’s tall and upright or columnar growth make them excellent choices for areas with limited space. Expect to pay more for Hawaiian-grown Dracaena Michiko. Janet Craig ‘Compacta’ is a very small bird nest-like plant about one foot tall with small leaves. Compacta is similar to Janet Craig but much smaller. This variety is slow growing and very durable. It has been around for about 25 years. We see it grown more as a low table top plant in 6-inch pots and also in multiples of three’s in larger pots.